Currently install iro long arm and otk steering. Doing ball joints, wheel bearings, new brakes including calipers, quick disco, flipping rear axle and putting in a dana 44 I picked up. Since the axle was close to being out anyways I just removed it and did the rear main seal. Way better with the axle out lol. I didn't take a ton of pics on everything but you get where this is going. I made a gas can holder and a basket for a cooler. I haven't finished the basket yet. On the short arm you can see I welded some square tubing on the arm so I can make whatever attachment I want in the future. With a ton of measurements it knew it was going to be a tight tight fit to get that swing out hindge to fit between the tailight and the tailgate. Once the hinges were in a good location and mounted the bumper one last time. Checked everything again. Once I pulled it off I braced the whole inside of the bumper at the hinge to make sure it was supported good. Once the hinge was burned in I started making the swing outside. The right longer arm is for the tire and left for whatever as you will see later. I've always wanted a dual swing out. Since nobody makes anything for the mj platform my solution was to do it myself. Since this is going to be a DD adventure rig I need to keep the bed space free. I like the overland rigs with dual arms because you have tons of flexibility. Also with the one swing out the are needed to open it is huge. The dual arm seemed like the way to go. I started with a jcr DIY bumper and ordered a bunch of stuff from ruff stuff. As you can see the hinge for the tire carrier is beefy. JCR rock sliders painted and mounted. Have these as well on my xj and they are beef. Found this roof rack off a guy on here. Used it on his xj and got it with brackets for a great deal. 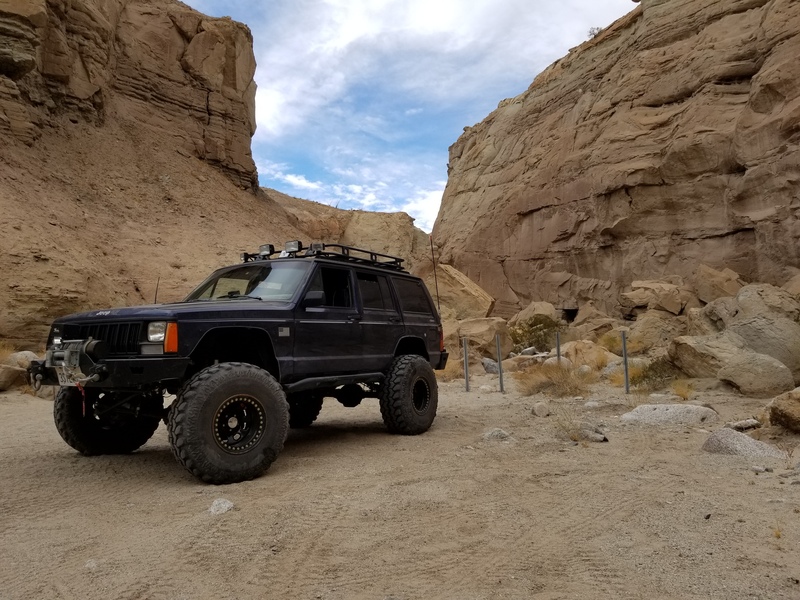 I have the same rack on my xj and like it. The front looks good slanted. Also found the color I'm going to paint it after I do a bunch of body work. Probably awhile off but we will see. I'm going to do the one on the left. Here is the oh that's why there wasn't a bumper shot lol Bought some frame stiffeners that had the bumper tabs built in. I cut the backs off as I was being lazy and didn't want to take the spring and shock out Found a company that makes what looks like a knock off jcr bumper. We will see how it holds up.